When we look at the life of Paul, we are quick to see a man who is so passionate for Jesus, who lived a life worthy of the calling of the gospel... but it wasn't always like that for him. Meanwhile, Saul was still breathing out murderous threats against the Lord's disciples.... As he neared Damascus on his journey, suddenly a light from heaven flashed around him. He fell to the ground and heard a voice say to him "Saul, Saul, why do you persecute me?" "I am Jesus, whom you are persecuting, he replied." "Now get up and go into the city, and you will be told what you must do." 1. No one is too far from the saving grace of God. Saul's conversion in the road to Damascus shows us that no one is out of reach of God's hands. In the past, I admit to sometimes looking at some people and being quick to judge them (whoops sorry!) and thinking that they're already too far gone... But God's grace is powerful than any mistakes we did in the past, than any vices and bad habits that have gotten a hold on us, than any broken relationships that left us running to the opposite direction, far from God's presence. But God's voice will always take us back and lead us, just like what He did in the life of Saul. And same goes for our relatives and friends whom we have been praying for so long and whose fruits we are still yet to see with our very own eyes. But how do we persevere in praying for them? This brings us to the next point we can glean from the passage. 2. We have to be intentional in looking at each one how God sees them. Lord, Ananias answered, I have heard many reports about this man and all the harm he has done to your saints in Jerusalem. And he has come here with authority from the chief priests to arrest all who call on your name"
When Ananias was instructed by God to go to Saul, it was as if he was reminding God just the kind of a man Saul was. It was as if he was asking God, "really God, this man?! Have you forgotten what he has done to us and the church? 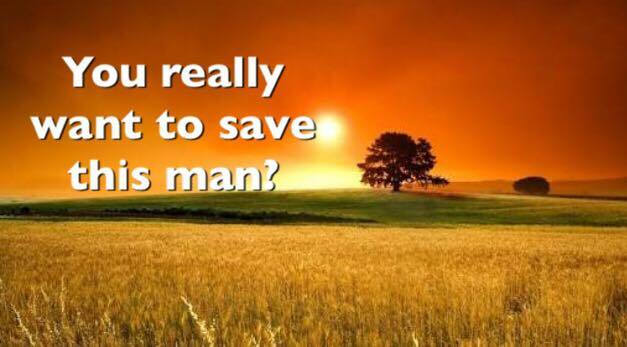 You really want to save him??" But it wasn't up to Ananias, it was up to God. It wasn't up to how Ananias saw Saul, but how God sees him... and when God looks at each one of us, He looks at us with an identity and purpose. Remember the time He snatched us from a life of darkness and purposeless-ness? It is the exact same thing that He is asking us to do with the people that we are believing God for... to look at them with His eyes, that they are also God's people who are valuable and whose lives are meant to give glory to God. 3. It is still God who takes off the scales off other people's eyes. Sometimes it is easy to take things too personally when we start to engage someone. When they reject us, we feel sad and wonder, "did I do something wrong?" "did I miss a step?" "maybe if I explained things better, she would now have a relationship with Jesus..." On the other hand, when we see them grow, we may run the risk of taking the credit for ourselves, giving ourselves a pat on the back for a job well done. 1. Who are the people in your life that feel are too far from the grace of God that you need to keep believing God for? 2. Allot a day in a week when you would regularly pray for them and ask God how He wants you to reach out to them.